An invaluable resource for couples in which one or both partners have Attention Deficit Hyperactivity Disorder (ADHD), this authoritative book guides troubled partners towards an understanding and appreciation for the struggles and triumphs of a relationship affected by it, and to integrate ADHD into their relationship in a more positive and less disruptive way. Going beyond traditional marriage counseling which can often discount the influence of ADHD, this discussion offers advice from the author's personal experience and years of research and identifies patterns of behavior that can hurt marriages—such as nagging, intimacy problems, sudden anger, and memory issues—through the use of descriptions of actual couples and their ADHD struggles and solutions. The first third of the book is dedicated to helping couples identify how ADHD impacts their relationship. 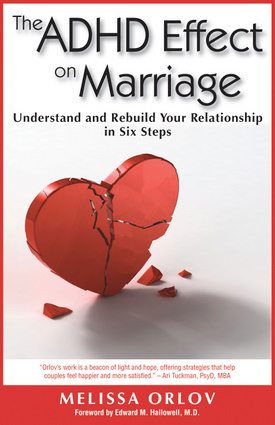 The last two-thirds provides a specific set of steps couples can move through to overcome their hurt and anger, once again develop loving ways to interact with each other, and find the joy they’ve lost in their struggles. This book encourages both spouses to become active partners in improving their relationship and healing the fissures that ADHD can cause. Also included are worksheets and various methods for difficult conversations so that couples can find a technique that fits their unique relationship and improve their communication skills. “Readers will find a wealth of information and support as well as practical tips, exercises, and stories.” —Kate Kelly and Peggy Ramundo, coauthors, You Mean I’m Not Lazy, Stupid or Crazy?! Melissa C. Orlov is one of the leading experts on how ADHD affects marriages. She writes a regular column on this topic for ADDitude Magazine, gives lectures, and writes online at www.ADHDMarriage.com. She lives in Wayland, Massachusetts.